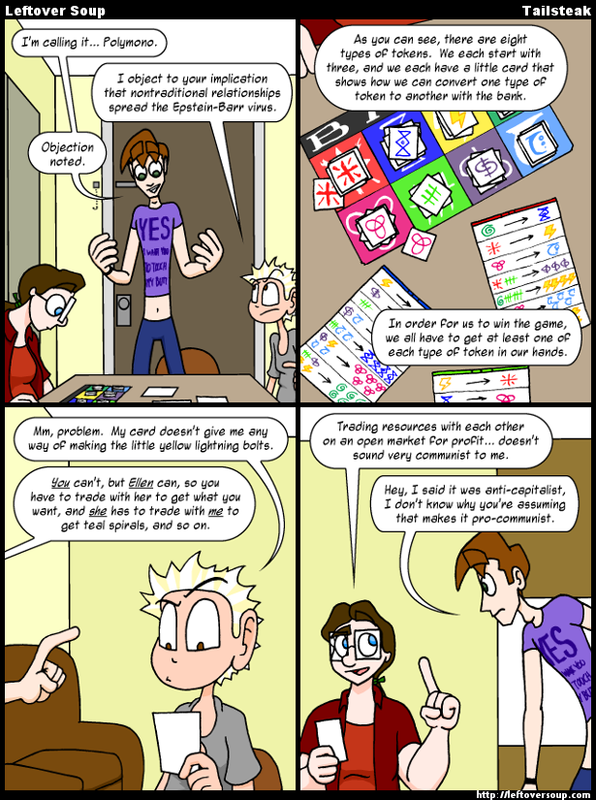 Like many of the other board games in Leftover Soup, there should be enough in the comic itself for intelligent readers to put together a rough approximation at home. As with all games I/Jamie create, I encourage you to make your own version, tweak it however you like, share it with your friends, et cetera. JH (displaying game): I'm calling it... Polymono. MH: I object to your implication that nontraditional relationships spread the Epstein-Barr virus. JH: As you can see, there are eight types of tokens. We each start with three, and we each have a little card that shows how we can convert one type of token to another with the bank. JH: In order for us to win the game, we all have to get at least one of each type of token in our hands. MH: Mm, problem. My card doesn't give me any way of making the little yellow lightning bolts. JH: You can't, but Ellen can, so you have to trade with her to get what you want, and she has to trade with me to get teal spirals, and so on. EB: Trading resources with each other on an open market for profit... doesn't sound very communist to me. JH: Hey, I said it was anti-capitalist, I don't know why you're assuming that makes it pro-communist.